From the Front Porch: When Misfortune Strikes! Image via Wikipedia: Job arguing with his friends. Summary: Sometimes, bad things happen to us that are beyond our control. How we respond to these things is a sign of our character and faith in God to make sure we have the grace we need to take us through times of trial. Poor Job. One can only look at him and feel empathy, even sympathy for his plight. He was a great guy who had a wonderful relationship with God, a relationship where God blessed him abundantly in his life. Then, seemingly out of nowhere, misfortune struck. His herds targeted by thieves, thugs kidnapped his servants, and his family died in a raid on their home. To top it off, Job suffered a painful skin disorder. -Eliphaz suggested that Job’s misfortunes were due to his human imperfection and, although Job couldn’t think of anything he had done to cause divine displeasure, he must now accept divine discipline. 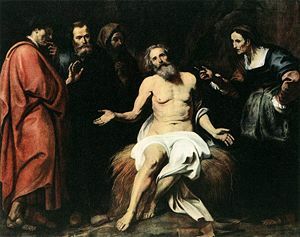 -Bildad suggested that perhaps Job’s children had offended God and that was the reason Job was experiencing such great misfortune. -Zophar indicated that God doesn’t just punish people for no good reason and that Job, as innocent as he claimed to be, was actually guilty of something or he wouldn’t be experiencing the magnitude of misfortune that he was experiencing. Eventually, Job’s responses to his friends leave them angry and they leave. Then Job begins his “pity party”. And, while he’s wallowing in his sorrows, he he blamed God for his misfortune. Isn’t that what happens when misfortune strikes us? We can’t wrap our brains around it or imagine what we did to deserve it. But we have to go through the pain of the darkness and uncertainly that casts a pall over our lives. Certainly someone or something has to be the cause of our pain or misfortune. And when we can’t figure it all out, the only person in the universe left to blame, is God. Often, even though we struggle to understand why things happen to us, we can’t accept a simple answer — the answer that God, in effect, gives Job: we are imperfect creatures who live an imperfect life. As human beings, we experience great moments of joy and some moments of pain, sorrow and loss. It all comes with being human. Job’s story teaches us two very important lessons about human nature and one important lesson about God. First, we can learn from Job that bad things happen to good people because live in an imperfect world. Sometimes, bad things happen to us that are beyond our control to avoid. Although we don’t deserve these moments of trial, we cannot avoid them. They are simply part and parcel of what it means to be a human being. Second, Job’s friends teach us to watch who we call in time of crisis or need. Sometimes, “friends'” will overlay their troubles on our situation and, when they do, their problems wrongly become a critique of our life! Finally, we can learn that God is with us in our darkest, as well as our brightest and best, moments. Although he is not responsible for our misfortunes, he is always with us to provide grace to get through even the most difficult storms of our lives. He was with Israel in the darkest cloud as well as the brightest fire; with Elijah in the earthquake, wind and fire; and with King David through great moments of bad choices and horrendous mistakes. He will be with us too!